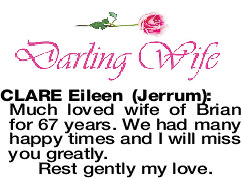 Much loved wife of Brian for 67 years. We had many happy times and I will miss you greatly. 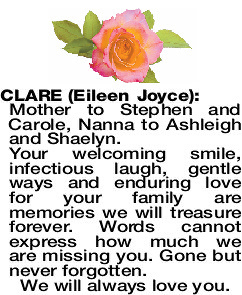 The Funeral Service for Eileen Joyce Clare of Bentley will be held at our MANDURAH Chapel, 49 Pinjarra Rd, Mandurah on THURSDAY (28.03.2019) commencing at 10am. Parking at rear of building. 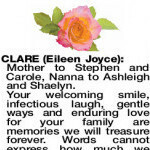 Mother to Stephen and Carole, Nanna to Ashleigh and Shaelyn. 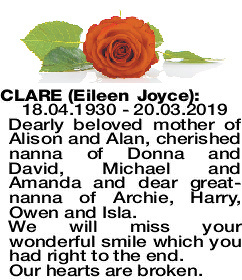 Your welcoming smile, infectious laugh, gentle ways and enduring love for your family are memories we will treasure forever. Words cannot express how much we are missing you. Gone but never forgotten. 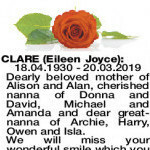 18.04.1930 - 20.03.2019 Dearly beloved mother of Alison and Alan, cherished nanna of Donna and David, Michael and Amanda and dear great- nanna of Archie, Harry, Owen and Isla. We will miss your wonderful smile which you had right to the end. 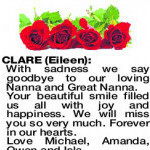 CLARE EILEEN With sadness we say goodbye to our loving Nanna and Great Nanna. Your beautiful smile filled us all with joy and happiness. 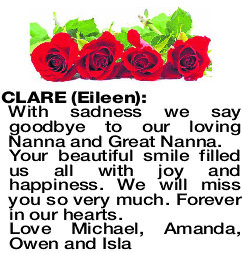 We will miss you so very much. Forever in our hearts. 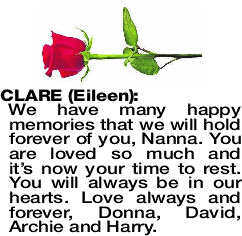 We have many happy memories that we will hold forever of you, Nanna. You are loved so much and it's now your time to rest. You will always be in our hearts. Love always and forever, Donna, David, Archie and Harry.